I N S I G H T Marketing and Research Newsletter A S S O C I A T I O N P E N N S Y L V A N I A Volume 11, Issue 2 Winter 2017 INSIDE THIS ISSUE: Top 10 Sales Tips from Ad Managers Across Pennsylvania Page 2 News Media's Social Media Presence Page 3 Creating a Digital Sales Culture – Leading by Doing Page 4 Just Released: PNA's Big Book of Monetizing Digital Page 5 Advertising Design and Campaign Planning to Help Reduce Churn Page 6 Bill Stuffer Touts the Benefits of Newspaper Advertising Page 7 Advertising Prospecting Categories for Spring Page 8 Spring Ahead with Advertising Sales Page 8 During PNA's recent Publishers' Convention in Philadelphia, three Philadelphia-area advertising agency professionals spoke candidly about what they saw as the strengths and weaknesses of the newspaper industry, shared insights into their media planning and placement strategies, and provided suggestions about how newspaper sales reps can earn more of the advertising budget. Newspapers are valuable assets for advertisers because: • They are a trusted news source. • Most newspapers are paid publications that people want to receive. • Retailers like to align their message with reputable brands. Some challenges arise when considering newspaper advertising as an option because of the decline in print circulation, lack of standardized print ad sizing, and limited digital inventory. Since advertising clients want to measure their return on investment from all ad placements, and sometimes question the value of newspaper advertising, ad agencies are tasked with having to substantiate their media recommendations. As a result, identifying the optimal media mix for clients requires even more scrutiny and analysis. Media planners must have a thorough understanding of the target audience their client is trying to reach, which includes information about their media consumption habits. Research data from respected organizations such as Nielsen Scarborough and MRI helps planners identify and support the recommendation, but can also add cost to the media buy that may not be available. Any research information that newspaper personnel can provide that demonstrates the strength of their product, and advocates for the effectiveness of newspaper advertising, is extremely helpful and valuable. 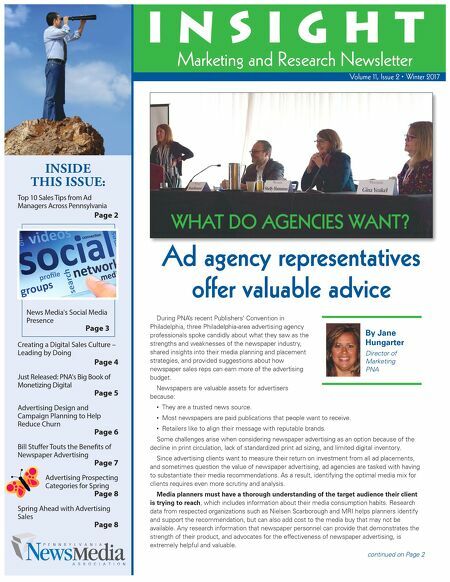 Ad agency representatives offer valuable advice By Jane Hungarter Director of Marketing PNA continued on Page 2 WHAT DO AGENCIES WANT?